R1 will be advertising the 123::/64 prefix to the local LAN. R2 and R3 are hosts which will generate IPv6 address from the Router Advertisement (RA). IPv6 hosts in the same broadcast domain use Neighbor Discovery Protocol (NDP) to find out the data link layer address of others. The functions of NDP are Neighbor Discovery, Router Discovery, Address Auto configuration, Address Resolution, Neighbor Unreachability Detection, Duplicate Address Detection, and Redirection. The NDP same as ARP does not have any mechanism to prevent masquerading attacks. We can use Secure Neighbor Discovery (SeND) to protect against such attacks. SeND uses a RSA key pair along with other parameters to generate an IPv6 address which is called Cryptographically Generated Address (CGA). The Router Advertisements are so crucial, in IPv6 deployments for stateless auto configuration. But as there is not implied security in the ND protocols we could use SeND to protect those. The basic idea is to introduce a third party who trusts the identity of the router who is supposed to send the advertisements. When a router sends a RA, the receiving node asks to the router an identity certificate. When the client receives the identity certificate of the router, it checks for the certificates authenticity. To achieve this 2 new ICMP types are defined, Certification Path Solicitation (CPS message type 148) and Certification Path Advertisement (CPA message type 149). CPS messages are sent from the nodes to routers asking for their identity. CPA messages are sent by the routers which contains the digital certificate of the router. First Let us configure R1 to be an IPv6 router which will then serve prefixes to the others for auto-configuration using SeND. R2 and R3 are hosts which generate address using CGA. Generate a RSA key pair. Get this RSA key signed from a trusted CA. The Prefix which the router advertises must be included in the certificate. Generate a CGA modifier from the RSA key. Link local address must be cryptographically generated. Step 1 Generation of RSA keys and getting it signed from the IOS_CA with prefix. First we can generate a RSA key pair with the name SEND. Then we must get this key signed from a Certificate Authority, in our case IOS_CA. Now we must get a certificate from a trusted CA. This certificate will have the public key of R1 be digitally signed with the private key of IOS_CA. The issued certificate from IOS_CA must also include the prefix which R1 advertises via RA. To achieve this we have to create a trust point (TP) and get this TP enrolled from the IOS_CA. % The 'show crypto pki certificate verbose SEND' commandwill show the fingerprint. At this point we must have a certificate issued from the CA with the prefix approved to advertise. The issued certificate has the prefix which will be advertised by R1. The IOS_CAs certificate has the prefix of 123::/32. Thus R1 is capable of requesting of any prefix which falls in this range. Step 2 Generation of CGA modifier. Now we have to generate a modifier for CGA. This modifier is based on the RSA key pair previously generated. Step 3 Activating Cryptographically Generated Link Local Address. The RA will be sent using the Link Local address. Thus the LLAddress must be CGA. For this we must first generate a CGA modifier. As the CGA modifier is generated we can now configure the interface to use this modifier. Then we can also generate a Link Local CGA for the interface. Finally we can advertise the prefix via RA. At this point we are finished with the Router configuration. 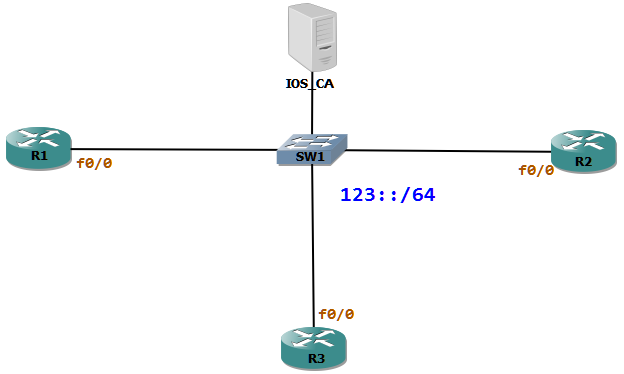 R2 and R3 are the hosts which will auto generate secure IPv6 address from the RA. To accomplish this we have to commit the following tasks. Activate interfaces for automatic address generation using CGA. Step 1 Generation of RSA key pairs and download IOS_CA certificate. First we generate a RSA key pair with the name SEND. Now we can create a trust point as it is needed to download the CA certificate. Step 2 Generation of CGA modifier and activating SeND on interfaces. The output of debug ipv6 nd secured shows that the CPS and CPS messages are exchanged, to verify the trustworthy of the RA.